March 20: Stop the Wars and Torture for Empire! Under President Obama, the US now has more troops deployed than it ever did under Bush! NOW is the time to raise the resistance and mobilize in the streets to demand an end to these unjust, immoral wars and occupations. 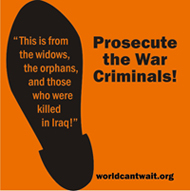 On the day marking the 7th anniversary of the invasion of Iraq, join World Can't Wait in Washington, D.C. on March 19/20 with Peace of the Action and the ANSWER Coalition. More details. Download this flier to use to promote March 20! Stop the Escalation, Out of Afghanistan Now! At some point soon in the days and weeks ahead, Barack Obama will announce his plans for escalating and extending the U.S. war in Afghanistan. 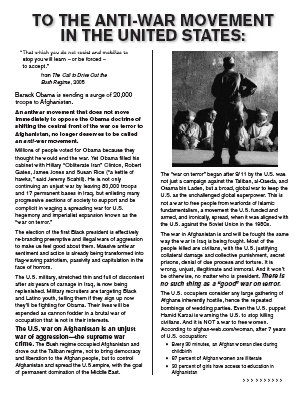 As Debra Sweet wrote recently, “whether Obama announces a troop increase to Afghanistan, or chooses the covert operations & unmanned drone option to try to "win" in Afghanistan, we should be in the streets opposing any escalation.” Get this leaflet out in your cities and towns, schools and workplaces and everywhere you can think of, and make plans for manifesting opposition right after the announcement is made. Barack Obama is sending a surge of 30,000 troops to Afghanistan. An antiwar movement that does not move immediately to oppose the Obama doctrine of shifting the central front of the war on terror to Afghanistan, no longer deserves to be called an anti-war movement. Millions of people voted for Obama because they thought he would end the war. Yet Obama filled his cabinet with Hillary “Obliterate Iran” Clinton, Robert Gates, James Jones and Susan Rice (“a kettle of hawks,” said Jeremy Scahill). What is the responsibility of the anti-war movement as the occupation of Iraq continues into a 7th year? And as the first wave of 30,000 additional troops is sent to Afghanistan? On March 5th, Fr. Luis Barrios, Elaine Brower, and Matthis Chiroux, addressed these questions, and made plans for moblizing mass actions on March 19th, and beyond, at a New York meeting. Debra Sweet moderating. Elaine Brower: Elaine is a leader of World Can't Wait and outspoken activist against the wars in Iraq and Afghanistan. Her son is currently stationed in Iraq. "It's Not OK."
Fr. Luis Barrios: Luis is an Episcopal Priest and Chair of the Department of Latin American and Latina/o Studies at John Jay College. On Monday, he will report for a 2 months sentence in federal prison for civil disobedience to Shut Down the School of the Americas at Fort Benning, Georgia last November. Barack Obama is sending a surge of 20,000 troops to Afghanistan. Stop the Criminal Bush Program! LET YOUR SENTIMENTS BE KNOWN! Boldly display your own "No Torture We Won't Live in A Torture State" vinyl banner! These well-crafted, beautifully designed banners are the perfect way to display your sentiments virtually anywhere - Schools, Churches and Places of Worship, Offices, Dorms, or Homes! Ideal for Rallies! Be Creative - Go Crazy! Create an Orange Up-Rising in your Community! Create an Orange Up-Rising on Campus! Call 866-973-4463 to order yours today! Click on each image to get the high resolution printable PDF.